1930-40s Goetz Country Club Beer Advertising Full Color Print "Pony Express"
This is an original 1930-40s Goetz Country Club Beer Advertising Full Color Print depicting the famed "Pony Express." This is a rare collectible. Approx. 44" inches x 32" inches. Absolutely beautiful. Extremely Rare Collectible. 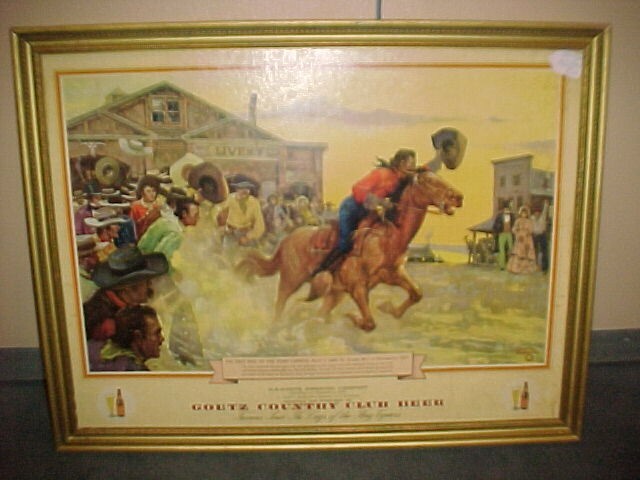 This is an original 1930-40s Goetz Country Club Beer Advertising Full Color Print depicting the famed "Pony Express." This is a rare collectible. Approx. 44" inches x 32" inches. Absolutely beautiful. Extremely Rare Collectible. Please email cowboycabin@centurytel.net with questions or call 406 270-2842.